Check "Load out of date addons"
Fixed Broken Functions. Fixed Icon selection and Macro buttons. 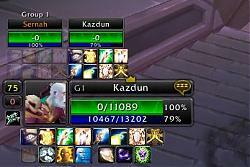 It is working fine on my shaman for now. The code for this mod still works after almost two years with no update. It works and doesn't eat up my resources! I wanted to thank you and the original authors for doing such a good job with this addon. i dont get it to work, if i push the range slidebar to 100% the button is there and i can click it. Not quite sure when this broke, but as of this evening I'm unable to get textures to appear for macro buttons using the defined syntax - all I get is a small green dot, and a green button on mouse over. A macro button I've already defined displays fine, but gets replaced by the dot as soon as I save. I've checked, and I get that even with only XUB (and the Blizzard stuff) in the AddOns folder - so interference from another mod is unlikely. From the SavedVariables fiile I can see that the texture name is no longer being correctly constructed (so, e.g., texture 4 gets saved as "INTERFACE\\ICONS\\4" rather than "INTERFACE\\ICONS\\Ability_CheapShot"). I can get around the problem by substituting the actual texture name for the number in the button definition, but clearly that's just a sticking plaster. Last edited by fredddredd : 09-28-12 at 05:27 PM. When I select PitBull frames, all I get is "..\FrameXML\UIDropDown|menu.lua line 452: attempt to index local 'icon' (a nil value)". I've entered frame names by hand, and that seems to be OK (I've been too busy soloing in MoP to see yet what happens on party frames and so forth, but the player one at least has been accepted, so I see no reason why the others shouldn't be). I'm also getting "..\AddOns\eXtremeUnitButtons\XUB_OnUpdate.lua line 453: attempt to call global 'XUBShowDebugMessage' (a nil value)" at startup on my Shadow priest. I will try to find time to check into it. Not sure what can be done for now unless you have some ideas. Does it break anything or just pop an error? If you can reproduce it I will look into fixing it. What classes are you using this with? I've had a couple instances of this error showing up. still not sure what's triggering it though. excellent! I'll do some testing over the next few days and let you know how things are working. I use this mod extensively.